So obviously Renita is the best first choice for the 25 Days of Christmas! I had hoped to have a new pattern available today, but life conspired against me. So it will be ready in a day or two! 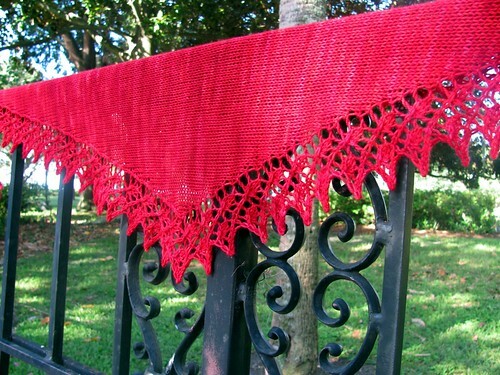 Renita is a shallow, triangle-shaped shawl that is worked from side to side. The yarn in the sample is the totally fabulous Bugga by The Sanguine Gryphon in the Tomato Frog colorway.